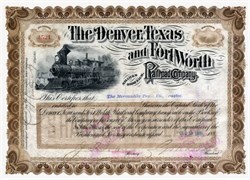 Beautiful certificate from the Denver, Texas, and Fort Worth Railroad Company issued in 1880's. This historic document was printed by Homer Lee Bank Note and has an ornate border around it with a vignette of a steam engine train. This item has the signatures of the Company's President, Grenville M. Dodge and Secretary and is over 126 years old. Grenville Mullen Dodge (April 12, 1831 � January 3, 1916) was a Union army officer on the frontier and during the Civil War, a U.S. Congressman, businessman, and railroad executive who helped construct the Transcontinental Railroad. He was one of the founders of the General Mills Corporation. Early life and career Dodge was born in Putnamville, near Danville, Massachusetts. He graduated from Norwich University with a degree in civil engineering. For the next decade, he was involved in surveying for railroads, including the Union Pacific. He was also a partner in the Baldwin & Dodge Banking Firm. Civil War Dodge joined the Union Army in the Civil War. At the beginning of the war, Dodge was sent by the Governor of Iowa to Washington, D.C., where he secured 6,000 muskets to supply Iowa volunteers. In July of 1861, he was appointed Colonel of the 4th Iowa Volunteer Regiment. He commanded the 1st Brigade, 4th Division at the Battle of Pea Ridge, where he was wounded. For his services at the battle, he was appointed brigadier general of volunteers and placed in command of the District of the Mississippi, where he was involved in protecting and building railroads. He was appointed major general in June of 1864 and commanded the XVI Corps during William T. Sherman's Atlanta campaign. At the Battle of Atlanta, the XVI Corps was held in reserve, but it happened to be placed in a position which directly intercepted John B. Hood's flank attack. During the fighting Dodge rode to the front and personally led Thomas W. Sweeny's division into battle. This action outraged Sweeny so much that he got in a fistfight with Dodge. Sweeny received a court-martial for this action while Dodge continued to lead the corps at the Battle of Ezra Church. During the ensuing siege of Atlanta, while looking through an eyehole in the Union breastworkds a Confederate sharpshooter spotted him and shot him in the head. He recovered but was unable to return to field command and he was placed in command of the Department of the Missouri. During the war, he provided information to Thomas Clark Durant, who smuggled contraband cotton from the Confederate States and who consequently made a fortune. He was wounded in the Atlanta campaign. After recovering, he was to complete the war as commander of the Department of the Missouri. Indian campaigns As the Civil War was coming to a close, Dodge's Department of the Missouri was expanded to include the departments of Kansas, Nebraska and Utah. During the summer of 1865, Sioux, Cheyenne and Arapaho Indians had been raiding the Bozeman Trail and overland mail routes. Dodge ordered a punitive campaign to quell these raids, which came to be known as the Powder River Expedition. Field command of the expedition was given to Brig. Gen. Patrick Edward Connor, who commanded the District of Utah. Connor's men inflicted a decisive defeat on the Arapaho Indians at the Battle of the Tongue River, but the expedition in general was inconclusive and eventually escalated into Red Cloud's War. Railroads During the 1865 campaign in the Black Hills, while escaping from a war-party, Dodge realized he had found a pass for the Union Pacific Railroad. In May 1866, he resigned from the military and, with the endorsement of Generals Grant and Sherman, became the Union Pacific's chief engineer and thus a leading figure in the construction of the Transcontinental Railroad. Dodge's job was to plan the route and devise solutions to any obstacles encountered. Dodge had been hired by Thomas Clark Durant who was the major investor in the Union Pacific. Durant was also defrauding the company and manipulated the route to suit his land-holdings. This brought him into vicious conflict with Dodge. Eventually Durant imposed a consulting engineer named Silas Seymour to spy and interfere with Dodge's decisions. Seeing that Durant was making a fortune, Dodge bought shares in Durant's company, Cr�dit Mobilier, which was the main contractor on the project. He made a substantial profit, but when the scandal of Durant's dealings emerged, Dodge removed himself to Texas to avoid testifying in the inquiry. Politics and later life In 1866, Dodge obtained the Iowa congressional nomination and won. This brought problems since he was also away much of the time building the railroad. His time in Washington was often spent lobbying on behalf of the Union Pacific, although he supported internal improvements to the West. He was a delegate to the Republican National Convention in Chicago in 1868 and again at the 1876 convention in Cincinnati. After his term in office expired, he returned to railroad engineering. During the 1880s and 1890s, he served as president or chief engineer of dozens of railroad companies. Dodge went to New York City to manage his growing number of businesses he had developed. Dodge returned to his home state of Iowa and died in Council Bluffs. He is buried there in Walnut Hills Cemetery. The famed Western frontier town Dodge City, Kansas, was named in his honor. Although Dodge Street in Omaha, Nebraska, the former location of Union Pacific Headquarters, is often reputed to have been named after him the street was actually named for influential (and unrelated) Iowa Senator Augustus Dodge. The Fort Worth and Denver City had been built with no state subsidy other than the right-of-way across state-owned lands totaling 2,162 acres. Service between Fort Worth and Denver began on April 1, 1888. During that year the Denver, Texas and Fort Worth acquired stock control of the Fort Worth and Denver City. In 1890 the Denver, Texas and Fort Worth became part of the Union Pacific, Denver and Gulf Railway Company, but both it and its Texas connection entered receivership during the panic of 1893. The Fort Worth and Denver City was reorganized in 1895 under the same name and charter, with Dodge as president. Since the charter of the Fort Worth and Denver City prohibited the construction of branch lines, new companies were formed to do any new work. The first of these companies was the Panhandle Railway Company, chartered on December 13, 1887, to build between Washburn and Panhandle City, where connection was made with the Southern Kansas Railway Company of Texas (Santa Fe). This fifteen-mile line was leased to the Santa Fe in 1898 and sold in 1900. The Fort Worth and Denver Terminal Railway Company was chartered on March 24, 1890, to give the Fort Worth and Denver City its own entrance into and terminal facilities in Fort Worth. Another company, the Acme Tap Railroad Company, was incorporated on January 7, 1889, when it became necessary to condemn a right-of-way from Acme to Agatite in order to construct an industrial spur to serve the Salina Cement Plaster Company. Other feeder lines were built at Wichita Falls, but these were not directly promoted by the Fort Worth and Denver City. Morgan Jonesqv and Dodge were among the parties who incorporated the Wichita Valley Railway Company on February 8, 1890. This company constructed a line from Wichita Falls to Seymour. Jones was also active in the Wichita Falls and Oklahoma Railway Company, chartered on October 12, 1903, to build a line to Byers, as well as in the Wichita Valley Railroad Company, which ran from Seymour to Stamford and was completed by January 1, 1907. Another company, the Abilene and Northern Railway Company, built between Stamford and Abilene. These feeders were all acquired by the Colorado and Southern Railway Company, successor to the Union Pacific, Denver and Gulf. The Colorado and Southern also constructed the Stamford and Northwestern Railway Company between Stamford and Spur in 1909. These feeders were all leased to the Wichita Valley Railway Company. In the 1920s the Colorado and Southern expanded its service area by building several new railroads. The Wichita Falls and Oklahoma Railway Company of Oklahoma was formed to extend the Wichita Falls and Oklahoma line to Waurika, Oklahoma. On March 6, 1925, the Fort Worth and Denver South Plains Railway Company was chartered to tap the growing agricultural market in the South Plains. This line began at Estelline and by mid-1928 had completed 206 miles to Lubbock and Plainview with branches to Silverton and Dimmit. The Fort Worth and Denver Northern Railway Company, chartered on May 29, 1929, completed its 110-mile line between Childress and Pampa in July 1932. Both the Fort Worth and Denver South Plains and the Fort Worth and Denver Northern were leased to the Fort Worth and Denver City for operation. Elsewhere during the 1920s the Fort Worth and Denver City extended service from Fort Worth to Dallas in 1925 by acquiring trackage rights over the Chicago, Rock Island and Gulf. In June of 1925 the Fort Worth and Denver City purchased the one-eighth interest in the Union Terminal Company at Dallas owned by the Trinity and Brazos Valley. As the first rail line to penetrate Northwest Texas, the Fort Worth and Denver City influenced the area's growth. The construction of stockyards at Wichita Falls and later railheads ended the necessity for long cattle drives. The Fort Worth and Denver City actively promoted the growth of towns and farming to increase traffic for the line; "No settlers, no trains" was the company's rule. The line is given credit for promoting winter wheat as food for cattle. The railroad pioneered control of wind erosion by furnishing trees and trees seedlings to use as windbreaks. The road urged the introduction of cotton to the plains country, actively supporting the work of agriculturist Seamann A. Knapp.qv The Fort Worth and Denver City cooperated with ranchers and land developers in experimental farms to show potential settlers the value of West Texas as farm country and was instrumental in lobbying for the first federally funded experimental farm in the Panhandle.qv The line also furnished seed for experimental plots on private lands to encourage agricultural diversity. Some of the line's major stockholders were closely associated with land development firms that provided land at extremely liberal terms to attract settlers to the region. During the drought years of the 1890s the railroad provided free seed for farmers to keep them in business. In other years the line acted as a banker for the farmers and accepted crop liens as collateral for loans. During the Centennial Year of 1936 the Fort Worth and Denver City and the Burlington-Rock Island cooperated in operating the first streamlined train in Texas, the Sam Houston Zephyr, between Houston and Dallas-Fort Worth. In 1931 the Fort Worth and Denver City and the Rock Island jointly leased the Burlington-Rock Island between Waxahachie and Teague and expanded the lease to the entire property in 1950. On June 13, 1952, all of the other Colorado and Southern properties in Texas, with the exception of the Burlington-Rock Island, were merged into the Fort Worth and Denver. In 1965 the Colorado and Southern and Rock Island absorbed the Burlington-Rock Island, with each owner acquiring an undivided one-half interest in the property. The Colorado and Southern's interest was also merged into the Fort Worth and Denver. Other acquisitions included the purchase of Wichita Falls terminal properties from the abandoned Wichita Falls and Southern in 1954. In 1973 the Fort Worth and Denver acquired forty-two miles between Stamford and Rotan from the Texas Central. However, this line was abandoned in 1976. Other abandonments included the line between Stamford and Spur in 1967, the Wellington to Pampa line in 1970, the track from Teague to Mexia in 1976, and the Sterley to Silverton section in 1978. When the Colorado and Southern was merged into the Burlington Northern Railroad on December 31, 1981, the Fort Worth and Denver expanded to operate the track between Texline and Denver. The Fort Worth and Denver, in turn, was merged into the BN on December 31, 1982. In 1989 the BN abandoned the former Fort Worth and Denver South Plains between Estelline and Lubbock in favor of trackage rights over the Santa Fe. Sixty-four miles of the right-of-way between Estelline and South Plains were opened in 1993 as a hike-and-bike trail as part of the Caprock Canyons State Park Trailway System.